Morel-À-l'huissier, Patrick and Tee L. Guidotti. "Asbestos (Mineral)". The Canadian Encyclopedia, 16 December 2013, Historica Canada. https://www.thecanadianencyclopedia.ca/en/article/asbestos-mineral. Accessed 22 April 2019. The name asbestos comes from a Greek word meaning "inextinguishable" (often mistaken to mean "incombustible"). Asbestos is a collective term that is used to designate 2 separate groups of silicates: the serpentine group and the amphibole group. The name asbestos comes from a Greek word meaning "inextinguishable" (often mistaken to mean "incombustible"). Asbestos is a collective term that is used to designate 2 separate groups of silicates: the serpentine group and the amphibole group. Asbestos is fibrous in nature, with a high length-to-width ratio. The term asbestos applies to 6 minerals that were exploited for their physical (high tensile strength, resistance to high temperature and electrical insulation) and chemical properties. Chrysotile is the only asbestos of the serpentine group; amosite, crocidolite, anthophyllite, tremolite and actinolite are the 5 asbestos of the amphibole group. Chrysotile, amosite and crocidolite were the 3 species extensively mined for their commercial value. Nowadays, chrysotile is the only asbestos mined for its commercial value, although crocidolite is still thought to be mined in South Africa, mainly for local and regional consumption. Production worldwide has decreased greatly since 1975 and most developed countries now have tight restrictions or outright bans on the use of asbestos because of concerns regarding health effects. The Romans used asbestos cloth over 2000 years ago for wrapping the dead for cremation. Asbestos was once called the "miracle fibre" and was used in over 3000 products. Since the concern over the health impact of asbestos became an issue, asbestos has ceased to be used in thousands of products. Today, its main use is in the asbestos-cement industry, which consumes between 85% and 90% of world production. Other uses include friction products (brake linings and clutch facing), roofing products, gaskets and special applications. Asbestos content in today's products varies from 1% or less to about 30%. Asbestos was first discovered in North America in 1860 in the Des Plantes River region of Québec. 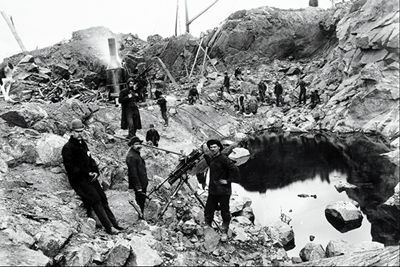 Canadian production began in 1878 at Thetford Mines, Québec. Once a thriving industry with operations in BC, Nfld, Ontario and Québec, the Canadian asbestos industry is now concentrated in Québec, where 2 companies, LAB Chrysotile Inc (the largest Canadian producer) and JM Asbestos Inc, operate mines at 4 locations. Production of chrysotile asbestos ceased in BC in 1992 when the Cassiar Mining Corp was forced into bankruptcy. In Nfld, production of chrysotile asbestos was suspended in 1995 when the Teranov Mining Corp did not re-open its wet-milling tailings reprocessing operation. In Canada, with the exception of the Nfld tailings wet reprocessing, a mechanical dry-milling process separates fibres from rock by repetitive breaking and return of nondisintegrated rock, drying, separation of fibres from rocks by suction at each step, cleaning, grading and packaging. The Canadian grading system divides mine products into crude asbestos; hand-selected, cross-vein material, which may comprise up to 10% or more of the rock; and milled asbestos, all grades produced by mechanical treatment of the ore. The world's leading asbestos producers are Russia, China, Canada, Zimbabwe and Kazakhstan. Most of Canada's asbestos production is exported. Medical researchers suspected as long ago as 1898 that serious health effects could result from the inhalation of asbestos dust. It was not until a series of studies beginning in the 1950s that exposure at levels then common in the workplace was shown to cause a variety of occupational diseases, the major ones being asbestosis, mesothelioma and lung cancer. Asbestosis develops over years of exposure to relatively high levels of asbestos dust and results in extensive scar formation in the lung, causing breathing abnormalities, inadequate oxygenation of the blood and a high risk of developing cancer later. These effects often cause disability and sometimes death. Malignant mesothelioma is a cancer of the membranous lining of either the chest or the abdomen. Usually fatal, malignant mesothelioma is very rare except among persons exposed to asbestos, among whom it usually develops 30 years or more after moderate to high exposure. Lung cancer may develop 20 years or more after the first exposure to asbestos even in the absence of asbestosis or other visible effects. Cigarette smoking greatly increases a person's risk of lung cancer after exposure to asbestos but plays little or no role in the other disorders mentioned. Asbestos, particularly crocidolite and amosite, has been associated with a worldwide epidemic of these cancers. After WWII asbestos use increased greatly. By the 1960s and 1970s large numbers of asbestos-exposed workers were diagnosed as having asbestos-related cancers. In the 1980s the number of new cases declined as the workers grew older and died of these and other causes. The epidemic will continue for as long as substantial numbers of these workers are still alive. This has resulted in major lawsuits. Oddly, few of these cases involved asbestos mines because the material as mined is not as dangerous as in its refined form, and the asbestos mined in Canada is chrysotile. Some evidence suggests that chrysotile is less dangerous than amosite and crocidolite, but all forms of asbestos should be considered hazardous. Canadian researchers, particularly those associated with institutions in Québec, were among the world leaders in establishing the risks of exposure to asbestos. The safety of replacement materials such as manufactured vitreous (mineral) fibres is still under study. At least some appear to share the cancer risk, but at lower levels of potency. Others appear to be free of such risk. Occupational exposure regulations in all provinces require dust concentrations in the air to be controlled at levels presumed to be safe, and most provinces require periodic medical examinations of workers handling asbestos. Because of such regulations, improved technology to control dust levels, industry awareness and education among workers, exposure to asbestos in the workplace is much less of a problem today in Canada than in past decades. The greater problem appears to be safe removal of asbestos from where it has been installed in the past, particularly for insulation purposes. George A. Peters and Barbara J. Peters, Sourcebook on Asbestos Diseases: Medical, Legal and Engineering Aspects (1980); Irving J. Selikoff and E. Cuyler Hammond, eds, "Health Hazards of Asbestos Exposure," Annals of the New York Academy of Sciences CCCXXX (1979); Philip Harber, Marc B. Schenker and John R. Balmes, Occupational and Environmental Respiratory Disease (1995); William J. Nicholson, "Asbestos Problems: Environment and Occupational Aspects," in E.M. Cordasco, S.L. Demeter and C. Zenz, Environmental Respiratory Diseases (1995).